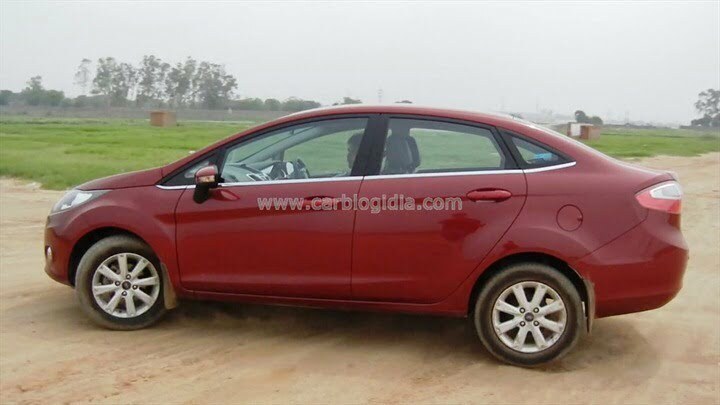 New Ford Fiesta by Ford India is one of the most attractive cars from Ford India’s stable until the upcoming Ford EcoSport launches on Indian roads to steal this title from sibling Fiesta. 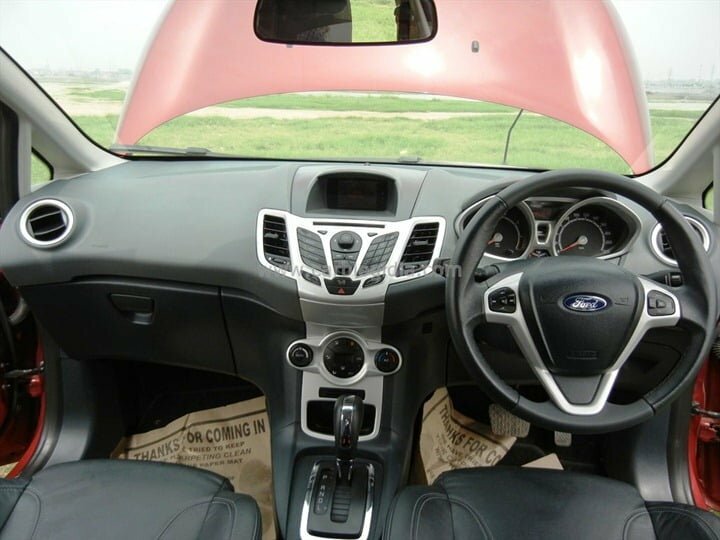 In the mid level sedan segment, Ford Fiesta offers some of the best in-cabin technologies and safety features in its class and we will give a detailed review of the same in this article. 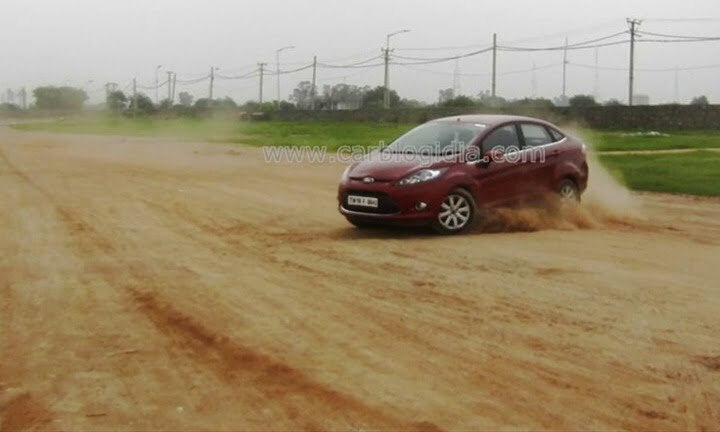 We tested Ford Fiesta PowerShift automatic with 6 speed dual clutch automatic transmission over two days on approximately 8 hours in various conditions including bumper to bumper traffic, city conditions, highway conditions, slight off-road, straight line sprint etc. 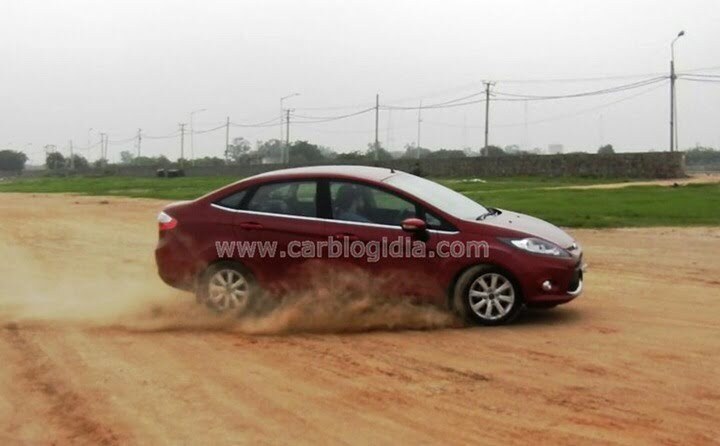 In this article, we will give you a detailed road test review of the Automatic variant of the new Fiesta Automatic. We have previously reviewed the manual version, you can refer to the our review here – New Ford Fiesta MT Test Drive Review And Video (both petrol and diesel). 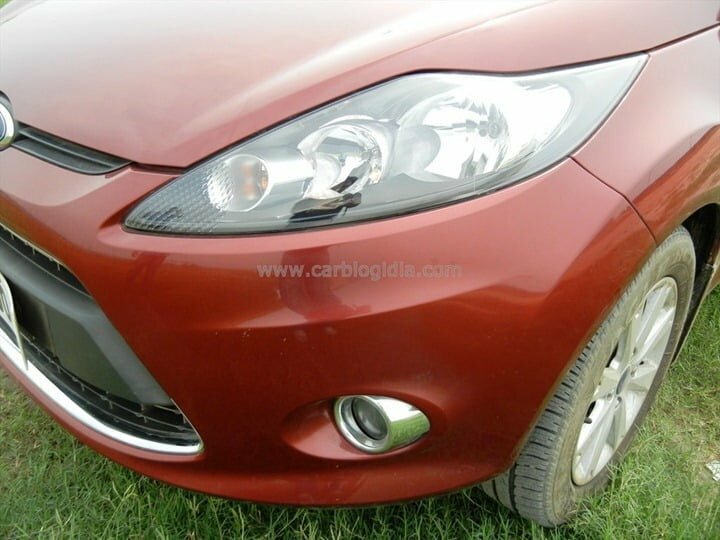 Talking of the visual appeal and exteriors of the Ford Fiesta, the car does look very sporty and dynamic in design. It is based on Ford’s new Kinetic design language. The side profile is not only aerodynamic in styling, but also very smooth and pleasing to eyes. The coupe like roofline, well sorted out elegance and simplicity merged with sport elements like large headlamps sweeping to almost the mid of front wheel arch, bold and pronounced wheel arches, contour lines running from front wheel arch and almost reaching the rear tail lamp, the tail lamp cluster with chunky shape and sweeping to sides, smart looking 8 spoke ally wheels, subtle use of chrome on exteriors like around fog-lamps, door window lining, front grill perimeter, boot gate etc. give it elegant yet not-gaudy styling. It maintains a sophisticated stance with small pleasing visual elements like the body coloured ORVMs with integrated turn indicators etc. 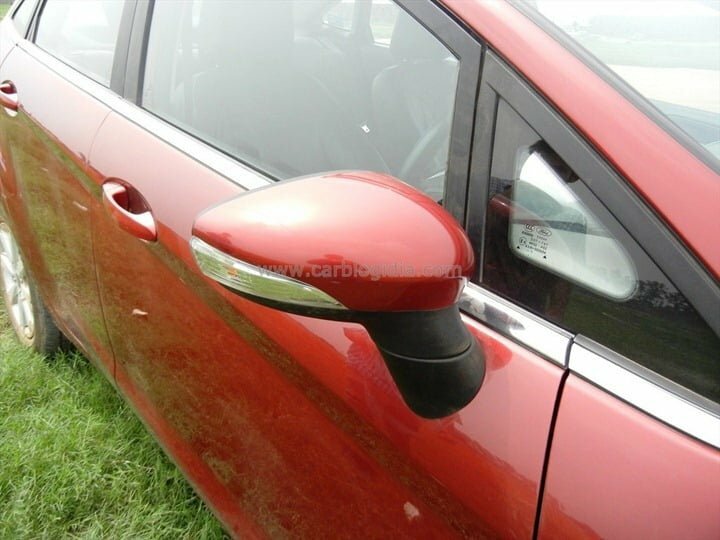 From the rear view, you may mistake it for a hatchback because of its sleek and slender rear profile which is designed keeping in mind the dynamic looks and compact form factor. Besides being a sedan, the car looks very sleep from rear. The quality of materials, paint job, fit and finish of body panels, exteriors plastics and lamps clusters is impressive and does add a premium appeal to the car. The Fiesta is a global product and is available across many global markets in the same exterior fascia, which is one of the reasons for a world class design with sophisticated design elements. 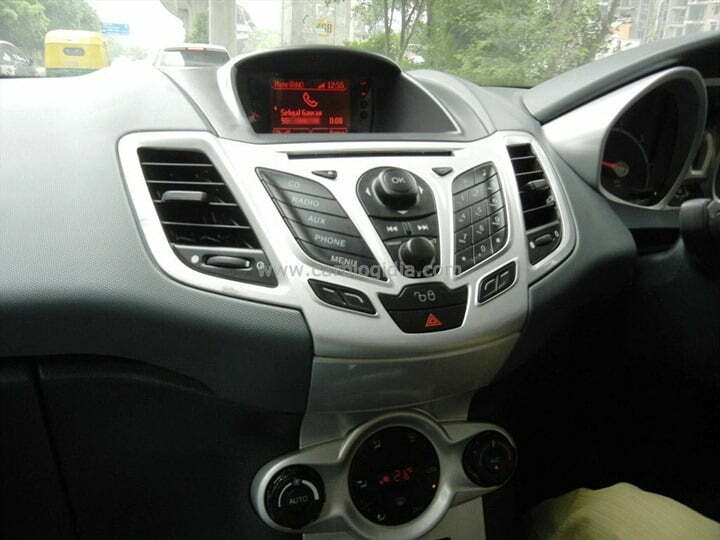 When you get inside Fiesta automatic, the most attractive part of the car is the central console which catches you eye. Beautifully and ergonomically designed central console is made up of high quality of plastics and metallic material with silver, black and gray elements which make it sporty. The steering wheel, instrument cluster, AC vents, inside door handles and grab handles, door trims etc. all follow the same colour theme. You may find the grey black interiors less premium compared the beige brown theme popular in most cars in this segment, but the quality, fit and finish more than makes up for it. Also because of large side window areas, the car does give an airy feeling on the interiors. The titanium trim which we drove had leather upholstery of improve quality, centralized audio system with Bluetooth and phone support, audio control features in the centralized console for phone, climate control and audio features. The feature list is very long and exhaustive including steering mounted audio controls, cruise control system, automatic climate control, phone support, drive side seat height adjust, bucket seats at front, reverse parking sensors which are very useful, multi-information display above central console which shows all infotainment data, trip computer with real time fuel consumption display, outside temperature display, distance to empty data, uphill gradient hill-hold assist, downhill gradient assist feature etc. to name a few. When it comes to safety, it comes loaded with dual airbags at front, ABS with EBD, ESP, high strength steel body frame etc. for improved safety of the occupants. 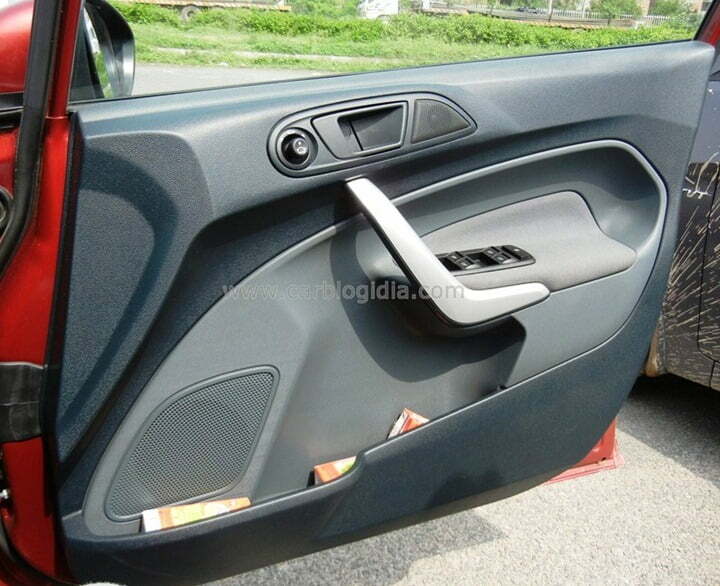 There is also remote central locking feature with engine immobilizer for theft protection. The foldable key also has a remote boot lid release button. Taking of space and comfort, the leg room and comfort at the front two seats is very pleasing with the bucket seats holding you firm in your place with ample comfort and under-thigh support. The leg room, headroom and shoulder room at front seats is quite ample for a comfortable commuter. When it comes to rear seats, the head room and leg room seem quite adequate but the sleek width of the car may make it slightly uncomfortable for 3 adults in the rear seat. Although it can seat three passengers at rear with ease, but the comfort levels are not very good as the width of the car is not very high at rear, for improved comfort, its better to seat only two passengers at rear and opening the foldable central arm-rest with cup-holder for long journeys. 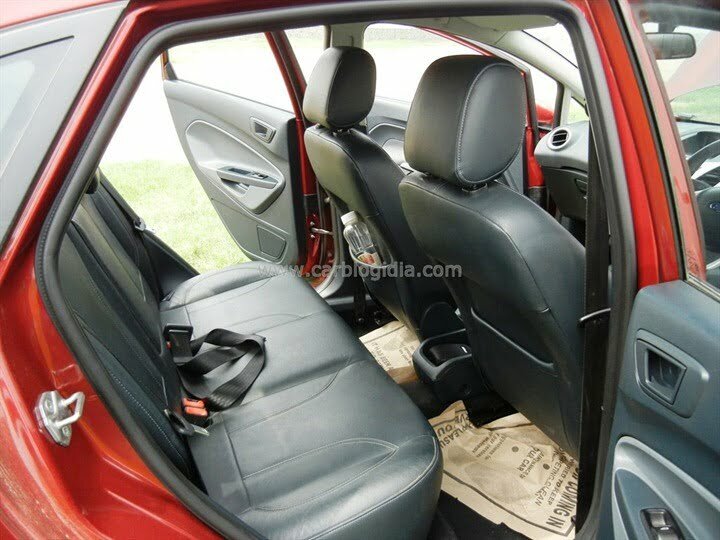 The quality of seats fabric, under-thigh support, cushioning of seats and leg room at rear are good. 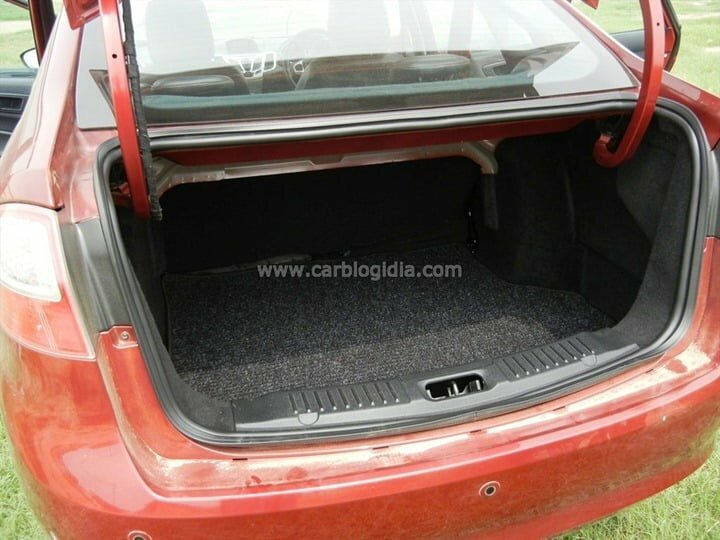 Talking of boot space for your luggage needs, the car offers a deep boot with a capacity of 430 litre however the loading height of the boot and access maybe a little difficult especially for heavy or bulky luggage but the capacity is quite impressive. Fiesta automatic comes only with the petrol engine options with a 1.5 litre TiVCT 4 cylinder petrol engine which delivers a peak power of about 88 BHP @ 6045 RPM and peak torque of 140 Nm @ 4500 RPM. 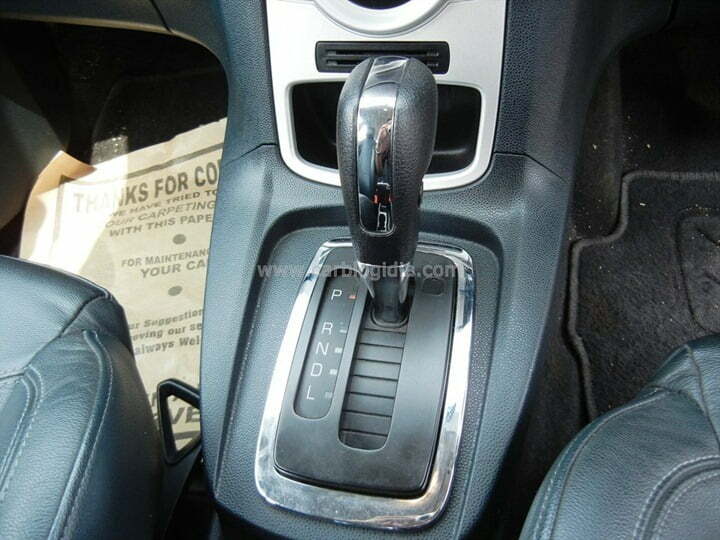 It is coupled to a 6 speed dual-clutch automatic transmission gearbox which is only one of its kind in this segment. The dual clutch transmissions are superior to the conventional automatic gearboxes with torque converters. 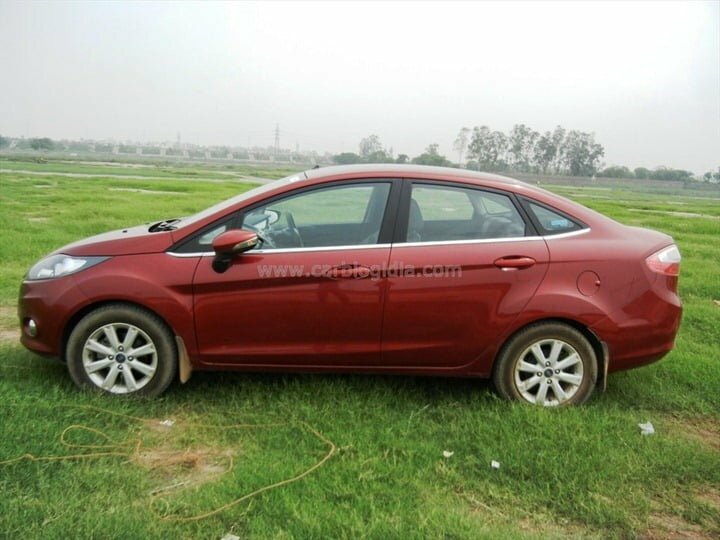 The dual clutch systems are usually found in expansive cars priced ahead of 15 lakhs, Fiesta is only car in this segment and class in India to feature this transmission technology. Such systems are as responsive as manual transmission and are also much more fuel efficient (10% to 20% more) than the conventional automatic cars. What this means in the real world driving is that you get the punch of a manual transmission at pickup, the acceleration at start is much better than conventional automatics, the feel of being connected to the road is much improved and the response is almost instantaneous without any noticeable lag. If you drive light-footed, you would probably even not notice when the gears shift as shift operation is much quicker in a dual clutch system. The gearbox uses electro-mechanical systems with microprocessor based logics to shift gears, if you are light footed, it keeps the car in easy rev range of up to 2000 RPM only which ensures higher fuel economy, but if you press the accelerator harder, it delays the gear shifts to keep the driving more spirited and give you more punch. If you floor the pedal, here is instantaneously one or two gears downshifts to give you the punch needed at that speed. With this intelligent logic, the car tries to run in a smooth rev band which is the reason behind its high mileage claim of 16.97 KMPL as per the ARAI data. In our tests, which included a lot of tests on various conditions, we got an average fuel economy ranging between 11 to 13 KMPL which is pretty decent. One thing which one may complain is the missing manual mode or triptronic or pedal shifts, but for the spirited souls, there is a mode called L, you can switch between D and L while the car is in motion as well. In the L mode, the car remains in the lowest possible gear for most responsive acceleration until the engine speed reaches the red line around 6000 RPM. We did few lamps of straight line sprints from 0 to 140 KMPH in the Fiesta and we found out that the L mode is surely sporty, but flooring the pedal is a quicker way as it does not rev all the way up to 6000 RPM, but close to 5000 RPM where the torque peaks (at 4500), so it gives you a better acceleration in D more with pedal floored rather than L mode. The L more in more useful for uphill climbs and places where the load on the car fluctuates because of bad weather, inclines and winds. Now lets talk about some areas which really impressed us better than everything else, yes, we are talking about the handling and performance. 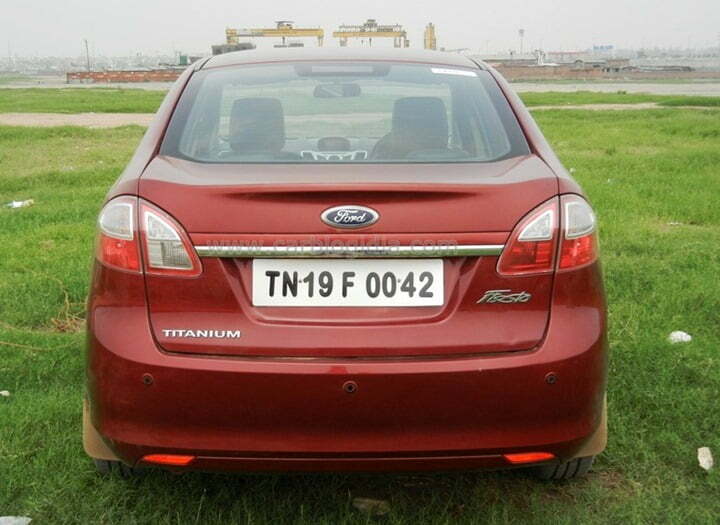 The car handles very well and is very well behaved even at speeds of 140 KMPH. We tries to sway the steering at the steering at speeds ahead of 100 KMPH and it did not feel shaky at all, the car points in the direction very precisely as per the steering control, the weight of the steering increases gradually with speeds and it has a tendency to center itself very well. The suspension is slightly on the stiff side, so it does pass on some bumps at the rough patches of road, but at high speeds and sharp corners, the suspension along with sharp steering the car feel very confident inspiring. 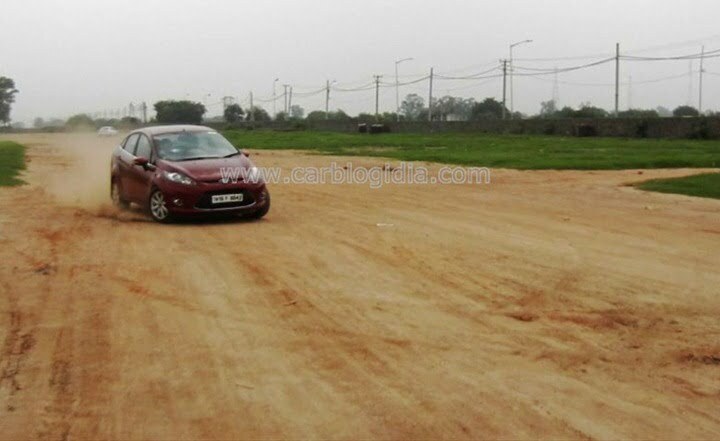 There is no bounciness or shakiness unlike some other cars of the segment. The car feels very well planted and in control at high speeds and cornering, there is almost no body roll. Braking is also quite effective with ABS and ESP kicking in when you make too sharp a maneuver, but the overall braking efficiency feels good. However braking at speeds in excess of 120 KMPH, the lack or rear disk brakes does get noticeable, but at most of the times, the brake force is adequate. 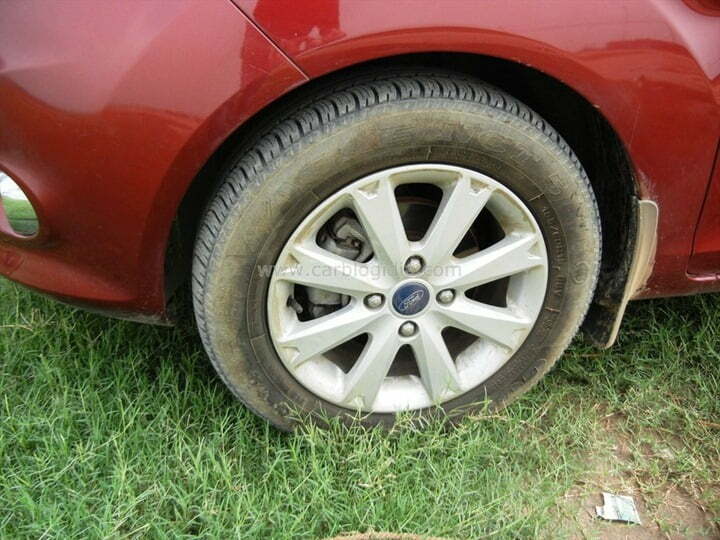 The rear wheels use large drum brakes while the front ones have disks, an all four disks might have been a useful addition, but nevertheless, the car is one of the most impressive handling cars in this segment. One of the most useful features is the ease of driving in congested traffic with the creep function where in the car gradually starts moving in D mode when you lift your feet off the brake pedal. The stress of changing gears and using clutch more of the times in bumper to bumper traffic (which is very common in Indian cities) is like a big boon. Another useful feature is reverse parking sensor which is very useful in parking the car in tight spaces in cities. 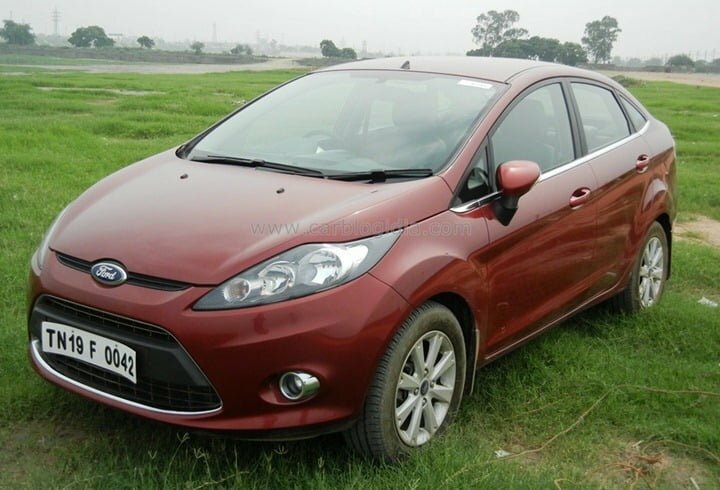 All in all, Ford Fiesta Automatic is a very impressive overall package with the USPs being power delivery, performance and superb handling which makes it stand out from all the automatics in its segment. Fiesta Automatic is prices between to Rs. 9.14 Lakhs to Rs. 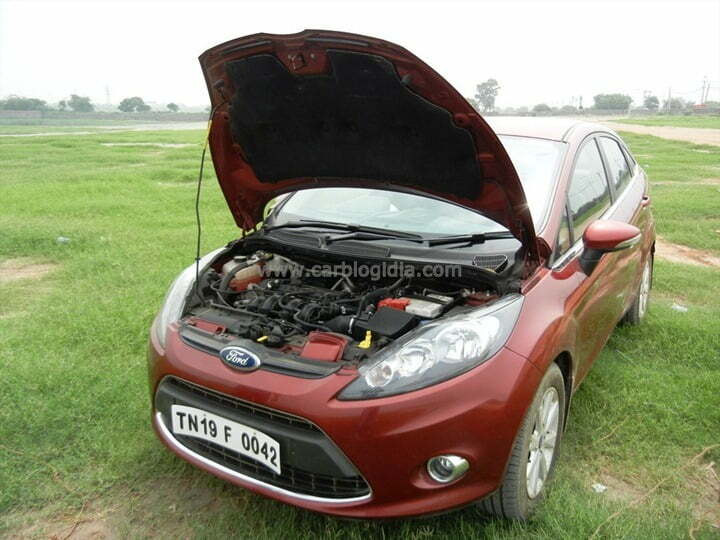 9.86 Lakhs ex-showroom Delhi which makes the approximate on-road price between Rs. 10 Lakhs to Rs. 11 Lakhs. At this price Fiesta seems to be one of the best automatic cars to drive because of its superior performance and handling.